Unfortunately we are no longer able to keep a list of stockists up to date, as we are supplying so many places! But here are a few of our favourites. Please note not all stockists stock all products. Various Coops around Kent as part of their local suppliers scheme, from Sandwich in the East, to Cranbrook in the South and Sidcup in the West. Farmers’ Markets in West Kent were really important in getting us going. They allow us to talk to customers about product development, and share news from the farm. Penshurst Farmers Market from me, on my stall – 1st Saturday of the month at Penshurst Place. If you would like to stock our products, please let us know via e-mail on eckleyfarms at waitrose.com or use the contact form below. We can deliver anywhere in England and Wales via courier, or if you are a caterer or shop local to us, we can deliver direct! If it’s easier, please do make use of our distributors. Our 5litre containers and our Oak Smoked Rapeseed Oil for the catering sector are available from Elite Foodservice all across the South of England. Our 5litre containers are also available from TH Brown Ltd, the fresh produce supplier in North West Kent. Our 2.5litre containers are available to London restaurants, cafes & pubs via Coastal Farm Eggs. 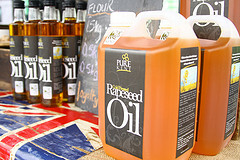 Rapeseed oil available in various sizes.